1. Have A Pinnable Image // I have said it before, and I’ll keep on saying it: Pinterest is the greatest social media channel available for bloggers. Pinterest has become its own search engine for tons and tons of different topics. It’s important that you create at least 1 “hero” pinnable image made for each blog post. This image should always be vertical. Canva has preset graphic sizes for all social media channels, including Pinterest. 2. Utilize A ‘Click To Tweet’ Plugin // Twitter is the most overlooked social media channel by bloggers. To be honest, I don’t understand why; I love Twitter! Whether you’re a blogger who’s a fan of Twitter or not, it’s essential that you include a click-to-tweet quote (or a few) in your blog posts. These can be quotes from your blog post, the title of your blog post, etc. Having these are great, because it makes it easy for your readers to simply click and tweet! I personally love the Better Click To Tweet plugin. 3. Have A Clear, Crisp Theme // Something that’s sometimes overlooked when considering how to get your blog posts shared more is having a clear, crisp theme. When I go to a blogger’s site, but it’s cluttered and has no clear theme to it, it’s hard for me to want to share their posts. If your blog is cluttered and there are tons of colors that don’t blend together all over, it’s hard for people to find a clear message. This can result in them not sharing your posts. You want to aim to create an inviting atmosphere within your blog. 4. Simple Fonts // Continuing off of my last point… simple is always best, especially when it comes to fonts. I highly recommend straying from serif fonts and only use san serif fonts. Serif fonts are slightly too busy, especially in a paragraph of text. If you’re using a busy font, it can even deter people from reading your entire post, never mind sharing it. 5. Participate In Facebook Blogging Groups // Facebook blogging groups are a great place to promote your content and to make friends with other bloggers. Most Facebook blogging groups have daily promotion threads where you can share your latest blog posts and engage with other bloggers. 6. Have Social Share Buttons Easily Accessible // Bloggers, you need to have social share buttons for your blog. If I read your blog post and love it, and I want to share it on social media, I typically will only do so if you have social media share buttons for your post. I love the Shareaholic plugin for this. They have a few different options for social share buttons. Another thing to keep in mind is to have them easily accessible. You don’t want your readers to have to search and search for the social share buttons. You also don’t want the buttons to be too small, because they can be easily overlooked. 7. Encourage Your Readers To Share Your Blog Posts // Simple, but such a helper… encourage your readers to share your blog posts! Ask your readers to share your post if they enjoy it or if it has been helpful to them. 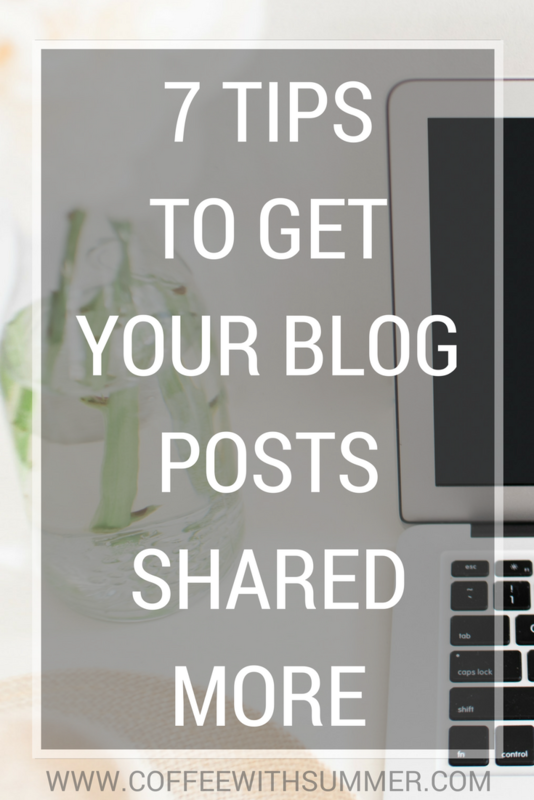 You’d be so happy and surprised to see how many will do just that – share your blog posts! What are some tips you have for getting others to share your blog posts more? What has been the top thing you’ve implemented that’s grown your traffic and have gotten others to share your posts more? Let’s chat!